One of the iPhone’s big limitations is that third-party streaming radio apps like Pandora can’t play music in the background. That is, you need to keep the Pandora app open to keep listening to music, and can’t listen while you’re reading email or using other apps. Before Apple offers a real fix to this problem, Major League Baseball Advanced Media appears to have figured out a creative workaround for this same situation, which it has to deal with when its iPhone app owners want to listen to live streams of baseball games while using other apps. 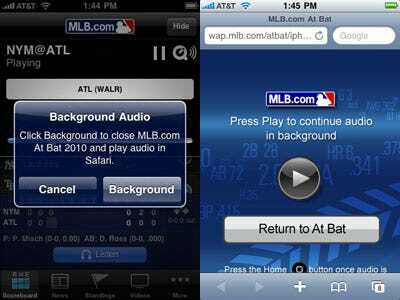 For the new version of its At Bat app, MLB has an option for users to push an audio stream from the app into Safari, which is one of the apps that can work in the background on the iPhone. It works by sending the user into Safari, where they click a “play” button, which picks up the Web audio stream in Apple’s QuickTime audio player. Then the user can use other apps while the audio keeps playing in the background. It’s not perfect, but it works. The best fix, of course, would be allowing apps to run in the background, which competitors like Google Android, BlackBerry, and Palm WebOS already offer. But if Apple still insists on barring third-party apps from working in the background, for user experience and battery life reasons, it has another option. Some developers have brought up the idea of offering third-party apps access to a background music API, which Pandora or MLB At Bat could use to keep audio streams running all the time without needing to add an extra step — like the Safari workaround. Either way, another nice bit of work by the highly innovative MLB Advanced Media tech staff.